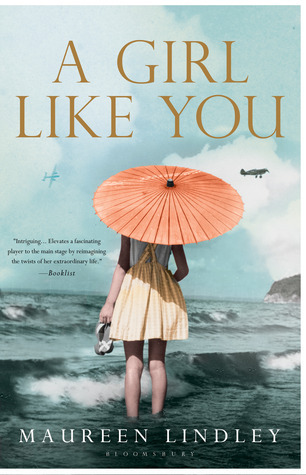 The concept was intriguing: the daughter of a Japanese mother and an American father, coming of age during World War II. Tamura and Aaron were happy in their marriage; they were content with the life they had built, on a smallholding, on the outskirts of a small town near the coast of California; and they were so very proud of their thirteen year-old daughter Satomi. Satomi wasn’t so sure that she belonged – she felt that she was neither Japanese or American – but she was bright, she was popular, and she had caught the eye of the most eligible boy in the school. She was happy. But war was looming. Aaron felt that he had to do his duty, he wanted to demonstrate that he and his family were loyal American subjects, and because he never wanted to be too far away from the sea he joined the navy. He was sent to Pearl Harbour, and he died there when the Japanese attacked. When the news broke neighbours who had known the family for years turned on Tamura and Satomi. And their government turned on them too, forcing them to leave their home, everything they owned, everything they had worked for and live in terrible conditions in an internment camp set high in the mountains of Colorado. Maureen Lindley tells Tamura and Satomi’s story simply and clearly, and in a style that is beautifully understated. The real history speaks for itself, and beautifully drawn characters and well chose details bring the story to life. Satomi wants to rebel, to speak out, but she knows that she must protect her mother, who is lost in grief for her beloved husband and bewildered by the actions of her birth. Maureeen Lindley’s account of life in the internment camp is both thoughtful and moving. Conditions are difficult, but a supportive community grows. Satomi comes to appreciate that community, her Japanese heritage, and most of all her mother, whose instinct is always to, quietly and thoughtfully, support others, to be a mother, a sister, a friend to whoever might need her. When the war ends, when the internment camp closes, Satomi must face the future alone. She still faces prejudice and hostility, but she has learnt from her mother, she gains support from the relationships forged in the camp, and she prevails. This part of the story is less successful than what came before. To some degree this was inevitable, because after the war could never be as dramatic as during the war, but there were elements of the story that seemed far fetched, and more suited to a straightforward romantic novel. I couldn’t help feeling that there was a more interesting story that might have been told. But Satomi’s character, her emotions, her reactions, rang true. Her journey was right, it was just the details that were wrong. Her story spoke of love, loss, and survival. it spoke of changing, learning, adapting, and growing. It shows easily humanity is lost in the face of ignorance, jealousy, and most of all fear; and it shows that there are people, who will stand up to try to do the right thing, to try to do good in the face of all of that. It taught me an aspect of history I knew little about, though a moving, engaging, and very human story. For all of those reasons, I am very glad that I read A Girl Like You. I usually enjoy stories of Japanese-Americans and the internment camps during WWII, so this appeals to me despite the unevenness…. plus the cover is lovely! Partly I think from growing up in Washington State, where Japanese Americans were also interned, I am fascinated by this tragic part of American history – how as you say neighbors & friends turned on fellow Americans, many with deep roots in this country. I have read autobiographical accounts, but I haven’t come across novels set in the camps before. I also like stories that focus on the internment camps. There was a camp here in Arizona and I find it so sad yet fascinating to read about. It sounds like this one might not be the best of the bunch, though. This isn’t a part of history I know much about, but I like the sound of this book.